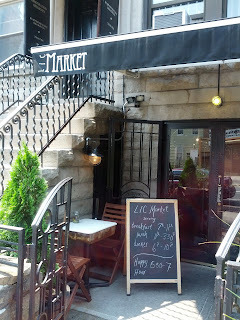 Call it cheating, but I am expanding the borders of this blog beyond Astoria to write about LIC Market, a seasonal-and-local restaurant near the Court Square subway stop. I know, I know: this ain't Vegetarian Long Island City. Sue me. Now, on to the review. Dr. Science and I had a rare Friday morning together, so we decided to go for breakfast at the restaurant, whose chef/owner graces the cover of the latest issue of Edible Queens. 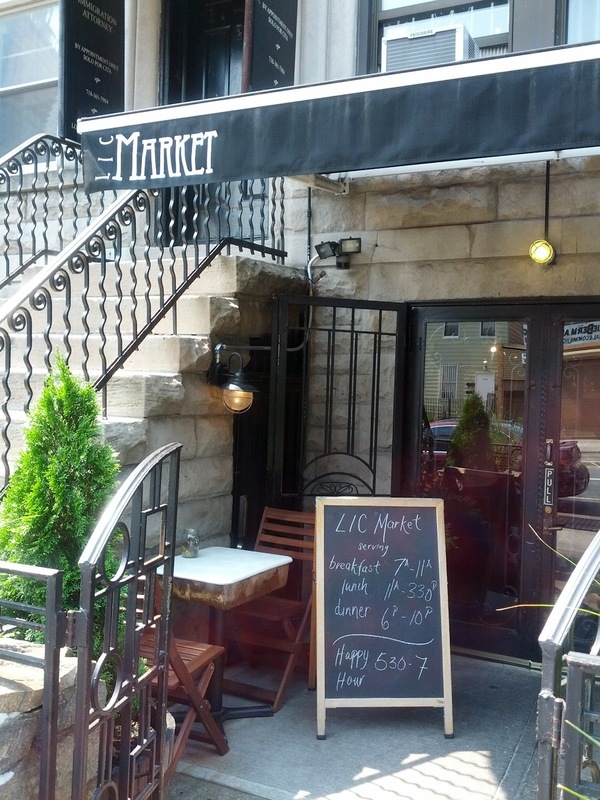 LIC Market occupies an attractive space on the ground floor of a townhouse. 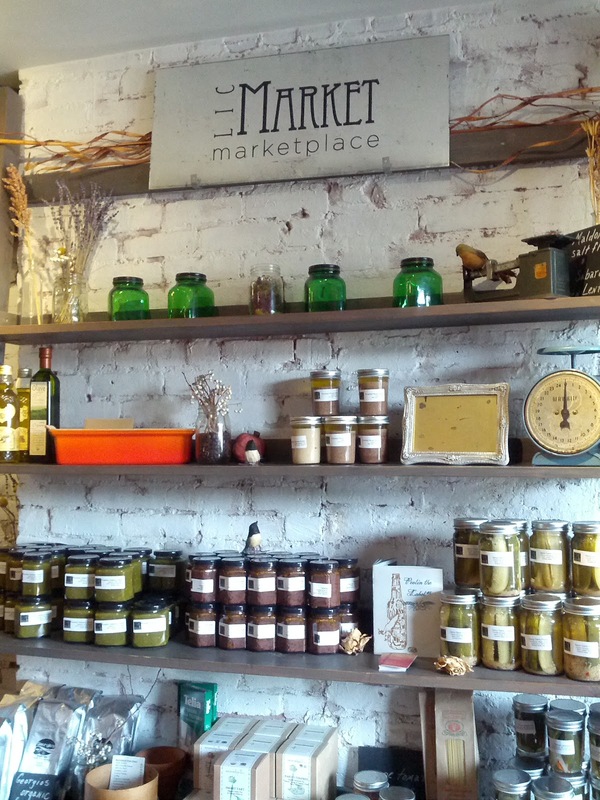 At the entrance is an actual market, selling jars of house-made pickles, salsa, and the like. 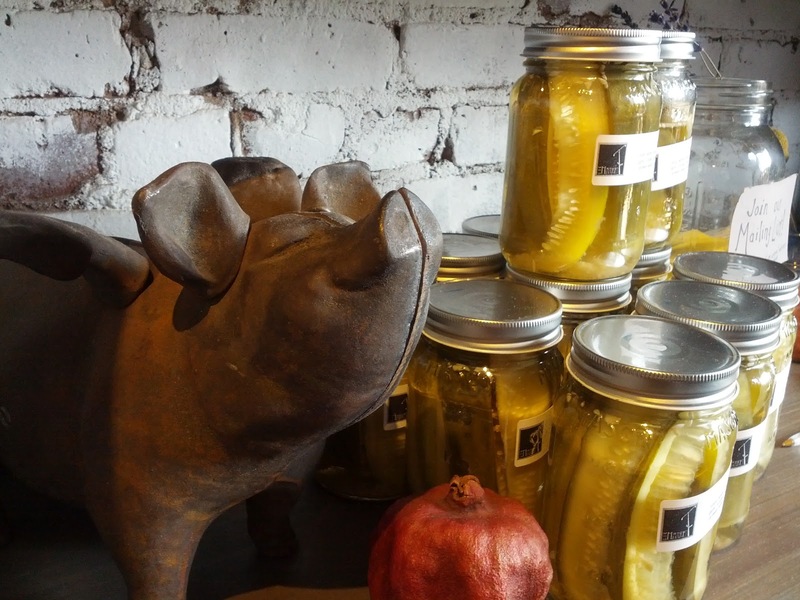 Original art hangs on the white brick walls, and the whitewashed wood tables give the place a pleasantly rustic feel. The main dining room was surprisingly hopping for a weekday morning, with a small crowd of 30- and 40-something professionals. 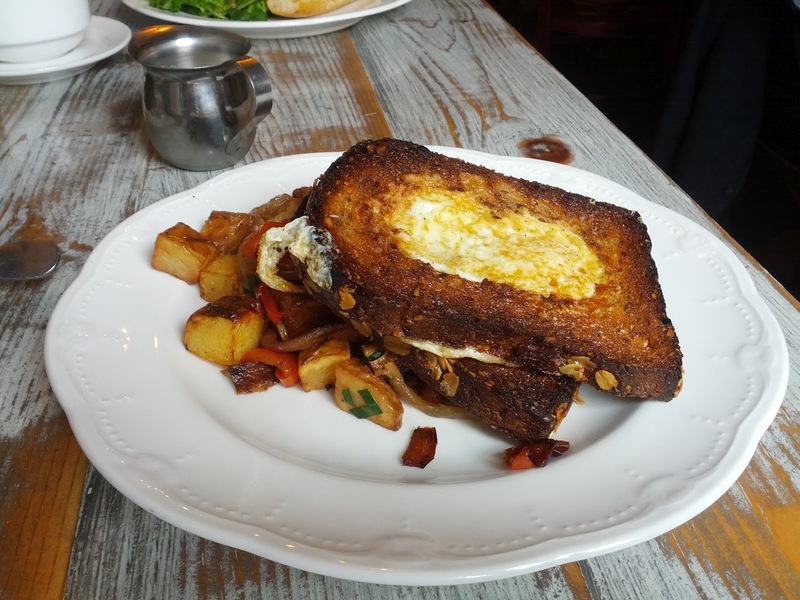 We shared two dishes: the Bullseye eggs, which featured two slices of whole-grain bread with eggs fried in the middle of them, and the gruyere and scallion sandwich. The bread in the Bullseye was quite oily and blackened at the edges, but a fork-stab to the eggs yielded a satisfying rush of yolk. (I'll say it again: I like my eggs runny.) The excellent home fries combined perfectly cooked diced potatoes with caramelized onions and red peppers. 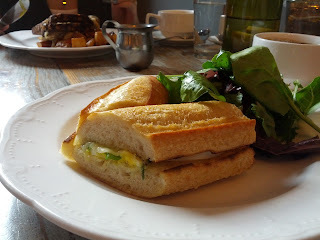 The sandwich, with its soft-boiled egg and generous amount of cheese, was tasty, though the baguette was a bit too white. It came with a side of lettuce, which could have used a nice vinaigrette. The staff was friendly and efficient, and the tab for two breakfasts with coffee came to $22, with tax and a generous tip. So, will we ever again take the N to the 7 just for breakfast? Probably not; there are too many appealing options within walking distance of our apartment, and if I'm not fed within 30 minutes of waking I get crabby. But we'll certainly return to LIC Market for lunch and/or dinner. As long as it's in Queens, it's all good.